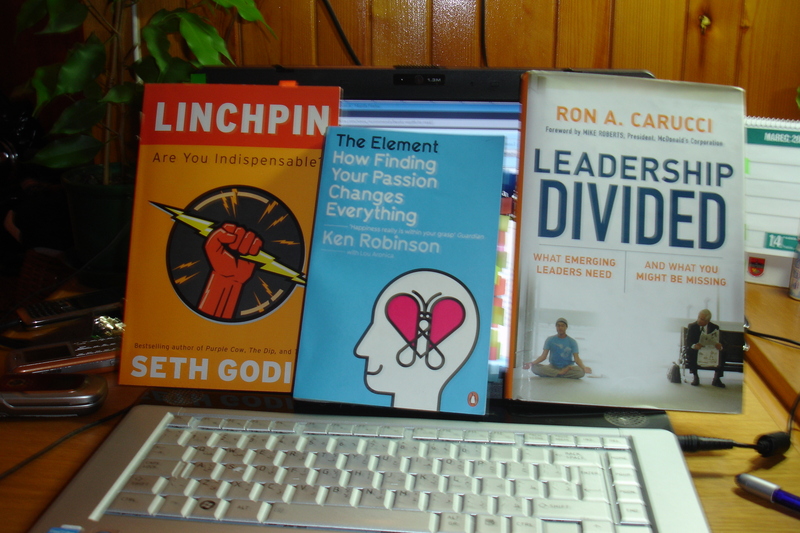 I have started 2nd month of 2010 with Ken Robinson and his super cool book Element. Main lessons learned are summed up in the blog post about reading books (consider video as bonus for you). Enlightenment for Slovakia was done via Slovak blog post about Ken’s book, including interesting quotes and basic info about Ken’s work, as he is pretty unknown here… I hope there are few more people in Slovakia who are aware about Ken’s art by now. Reading “climax” was accompanied by Seth Godin‘s new book – Linchpin. What to add about this book? I did give tribute to Seth’s gift in special live book review video about it and I did share Seth’s messages on Slovak blog as well. Linchpin was one of the best books I have ever read. Thank you Seth! Ron Carucci is person who has changed my life and his book Leadership Divided was the main reason how NGLS project was born. So let me dedicate column quote of the month to Ron. Book about how senior managers trained in more traditional leadership approaches could engage and connect with the emerging leaders of a new generation. Leadership is not someone does to someone else. Rather, it is something one does with someone else. Without relationship – pure, authentic relationship – nothing happens. When we seek to be seen without flaws, we wind up looking untrustworthy and under-performing. Art of meaningful, high-impact conversation is having a great cup of coffee. Life isn’t anything until you call it. Gratitude is the glue that transforms an organization into a vibrant, high-performing community. Thanks for the inspiration, have a great day! Florian, I am speechless and grateful, that my “shipment'” (you will be familiar with this term soon, when you will read Linchpin) had such impact that you bought book, wohoooo. I admit I’ve been focused on reading and learning online in recent weeks. I promise, I will pick up Linchpin before the end of March. I’ve been hearing too many good reviews. Thank you! I cannot wait to hear your take on Linchpin. I haven’t read the Road, but I saw the movie. It was chilling. I ended up valuing knowledge and books even more. Movie must have been chilling for sure. I have started to read book at night and I swear I was scared…but it was worth it, dialogues between father and son were so enriching, despite all the spooky surroundings. I will watch it shortly and I will let u know my take on it compared to book. Good to find your blog. I think you are the last drop in the bucket that has convinced me to get Linchpin. I will read it soon!